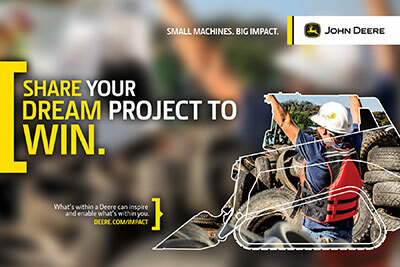 Through the contest, John Deere will collect community project ideas from members of the U.S. landscaping, agriculture and construction industries. The contest entrant with the most meaningful project idea will win his or her choice of a new John Deere G-Series skid-steer or compact track loader (CTL) with a WorkSite Pro attachment to complete the project. A group of finalists will be determined by John Deere; public voting to determine the winner will take place from June 1 to July 5. The grand-prize winner will be announced on July 10 as part of the 2017 John Deere Classic. Second- and third-place winners will win a yearlong lease on a skid-steer or CTL from John Deere Financial.